What is the sky without little fluffy clouds? Boring if you ask me. A cloudless plain sky is like a garden without flowers. Billow clouds are often good indicators of atmospheric instability. Cirrus clouds come in many shapes and sizes and occur in the coldest and highest region of the troposphere. The World Meteorological Organization classified the cirrus clouds in five species – fibratus, uncinus, spissatus, castellanus, floccus – and four varieties – intortus, radiatus, vertebratus, duplicatus. The delicate and thin cirrus radiatus clouds appear to converge towards one point on the horizon. The funny part is that they are actually parallel to one another; cirrus radiatus clouds don’t converge at all. The beautiful shelf clouds are low-level semicircular arcus clouds. Shelf clouds and roll clouds are two types of arcus clouds. Shelf clouds stick out like a shelf from their parent thunderstorm cloud. They form in association with a phenomenon known as gust front. This type of clouds is easily mistaken with wall clouds. The difference is that wall clouds usually appear at the rear of the storm, while shelf clouds on the leading edge of the thunderstorm. The cloud in the above picture has been captured over Enschede, Netherlands. Mammatus clouds are some seriously weird looking formations. Also known as mammatocumulus, they often occur in association with severe thunderstorms. Convection and buoyancy of air is the key in understanding how these unusual and scary clouds form. In Mammutus clouds, “evaporation causes pockets of negative buoyancy as it cools the air inside the cloud. This makes the clouds puff downward instead of up like cumulus clouds, and they end up being like upside-down bubbles,” says Dan Breed, a scientist of the National Center for Atmospheric Research for Wired.com. The Morning Glory cloud is another rare and equally dramatic phenomenon. These roll clouds occur in the lower atmospheric layer ahead of a storm front and can most often be observed in Northern Australia. Morning Glory clouds have been observed also over Germany, Central US, the English Channel and Eastern Russia. They can stretch 1000 km long and sometimes there are up to seven, eight consecutive Morning Glory clouds. Despite being studied for more than 70 years by scientists, this amazing atmospheric phenomenon is not clearly understood. This beautiful lens-shaped clouds are usually created by gravity waves. The stationary clouds can be classified into cirrocumulus standing lenticular (CCSL), altocumulus standing lenticularis (ACSL) and stratocumulus standing lenticular (SCSL). Do you know which is one of the most common misidentified UFOs? Believe it or not, it’s the lenticular cloud. Due to their amazing shape, lenticular clouds are often mistaken for UFOs. The anvil cloud, also known as cumulonimbus incus, is mostly composed of ice particles. It is a mature thunderstorm cloud that can cause a super-cell thunderstorm and then a tornado. Cumulonimbus clouds are divided into two species: calvus and capillatus. There are no varieties, but the anvil cloud is one of the nine accessory clouds. You can find more information on the website of the World Meteorological Organization. Here’s an interesting fact: the high-level anvil clouds often contain heavy snow because of the very cold upper layers of the earth’s troposphere. The snow melts into rain as it falls in warmer layers of air at lower altitudes. According to WeatherQuestions.com, 40 to 50% of the rain “produced by the average thunderstorm originates as ice and snow, even in the tropics”. Polar mesospheric clouds – night shining clouds – have been seen exclusively around the Polar regions, but noctilucent clouds appeared several times over Europe and the United States. This is a real concern, because scientists believe they are caused by global warming. Since this phenomenon is fundamentally new, it seems that more questions exist than clear answers. This type of clouds was first observed 126 years ago by an amateur astronomer. Located in the mesosphere, the mysterious noctilucent clouds are the Earth’s highest clouds. The clouds that form 50 miles above the Earth’s surface are generally colorless, although pale blue, green, dark yellow and red shining clouds occasionally form. Nicknamed the Jacques Cousteau clouds, undulatus asperatus is a cloud formation proposed two years ago as a separate cloud classification by Pretor-Pinney, British cloud enthusiast and founder of the Cloud Appreciation Society. 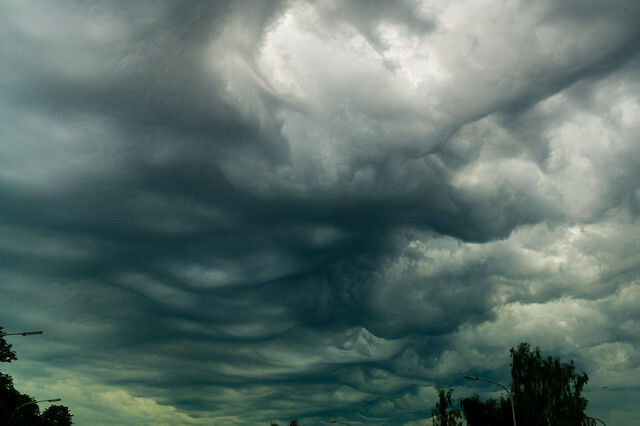 Pretor-Pinney proposed the formal name – undulatus asperatus – because the cloud’s form of undulation can be described as “very turbulent, violent and chaotic.” According to Guardian.co.uk, the roman poet Virgil used the word asperatus “in a poem to describe the surface of the sea whipped up by the north wind”. Polar stratospheric clouds (PSCs) form in the stratosphere at altitudes of 50,000–80,000 ft. They are classified into Types I (clouds with more diffuse and less bright colors) and II (nacreous or mother-of-pearl clouds), according to their formation temperature and particle size. Those are amazing photos of clouds. Some of them looks unreal. Kodos on the photographers!!! wow! simply amazing creation of God! wow, those are truly amazing!! Many of those are man-made chemtrails, look it up if you don’t know what it means, it’s not a creation of some “god” it’s Master Of Puppets behind the curtains poisoning you. Keep your paranoid conspiracy theories to yourself and just let everyone appreciate the beauty of nature. First, it’s not a “paranoid conspiracy theory,” it’s pretty well documented. Second, you and everyone else can enjoy the “god” or non-god creation of clouds in any way you like and Johns postulation that some are chemical trails shouldn’t derive you from your joy in seeing that. Those are clouds that are formed from the spraying. I’m have a penthouse view of the city. I can see small black planes spraying stuff. They form those rolls and then form strange clouds. This isn’t a conspiracy theory when people can actually see planes spraying stuff. They aren’t commercial planes. I can see the commercial planes flying into the airport. These planes are smaller and black. Some fly straight up in the air. Amazing pictures. These clouds look like from photoshop. These look unreal! #6 on the list is really something else. Seems impossible that all cloud forms have not already been discovered but then again I was on my back this afternoon and I swear I saw a formation no other human has seen before. The clouds like a leopards coat in 3D with some spots grey, some white, some pink – it lasted only a few minutes but was truly beautiful. Most of them are unnatural. I see small black planes spraying stuff. They form strange clouds. My former hometown, Lubbock, Texas was the site of ghost-like clouds in late October, early November this year. Do you have any photos of this phenomenon? No photos of these clouds from the “pre-chemtrial” era?